Oh we got a good welcome at all the toffs’ houses, up Junction Lane and round about, because… even the gentry had a certain love for the Pace Egg. Back in the 1970s I learned the Watersons’ version of the ‘Pace Egging Song’ from their seminal LP Frost and Fire (sorry but it’s a legal requirement to refer to it as a “seminal” LP; although you are permitted, as Mark Radcliffe did on Radio 2 this Wednesday, to call it “one of the most important folk albums ever made”). Then in the late eighties Malcolm Taylor of the Vaughan Williams Memorial Library put out an excellent cassette, The Leaves of Life, containing field recordings made by the collector Fred Hamer. May Bradley was of course one of the stars of the show, but the other was undoubtedly Mrs Emma Vickers of Burscough in Lancashire. I was really taken by her ‘Pace Egg Song’: it has a funny little kink in the rhythm in the chorus; a first verse with plenty of rhymes, but not necessarily where you’d expect them; and a splendid last line “if you give us a trifle you’ll never be no worse”. What’s not to like? Mrs Vickers, who had taken part in the Easter Pace Egging custom as child, and revived it later in life, had two Pace Egg Songs – this is actually the junior song, for use by the children. On The Leaves of Life she gives a good description of the characters’ costumes, and of how and where the custom was performed. The quotation at the start of this page is taken from that interview. Well I’m nothing if not predictable – what song did you expect me to post here, the weekend before Easter? The sun it shone brightly and keen blew the air. The air is keen all right, but I wouldn’t exactly call the morn bright and clear. Here’s the view from my window. 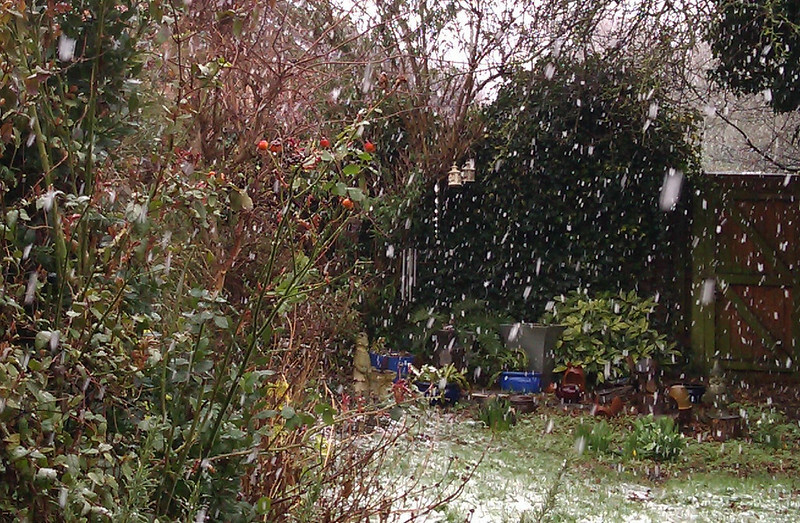 No roses in my back garden, and more snow than one would like, this week before Easter. As a Mudcat correspondent pointed out, Bob himself departed this world in the week before Easter, 2004. So this week’s song is dedicated to the memory of Bob Copper, a lovely man to whom so many of us owe so much. Here’s another song from Charlie Bridger, from Stone-in-Oxney in Kent. This is perhaps the song for which he has become best known – it was the title track of a compilation of Mike Yates field recordings on the Musical Traditions label, and the song was recorded by Jon Boden as part of his A Folk Song A Day project. Andy: Nip Bailey was it? Andy: Was he the one that worked in the oasts? Charlie: That’s right, he was the old hop-drier. He couldn’t see very well; I used to go and level his hops for him, ’cause he couldn’t …the old driers they had a chalk mark – red charcoal mark – round the roundel, you know, so if they had so many bags of hops, or so many pokes of hops, they knew that should come up to that certain mark, see, and he couldn’t see that old mark… [?] was dark, I remember an old storm lantern hanging up for a light in there. And I used to help the old boy with his hop-drying, of a night. Charlie: No that was Kenardington …on the corner; not the square ones, the single one right on the corner. High House Farm. There’s tomatoes and that they grow there now …an old man named Benny Coveney had that then; old bachelor. Adrian Russell: Was he well known locally as a singer? Charlie: No, he was known for singing ‘The Birds upon the trees’, that was all. He used to like a sing-song though, you know. Oh no, he was only known in Woodchurch really for his song ‘The Birds upon the trees’, that’s what they always used to associate him with, for his singing. My old grandfather used to say “Come on Nip”; he used to get his cornet out, my old grandfather; old Nip used to sing, and he used to play. In the pub, this was. Have you got ‘The Birds upon the trees’ taped, have you? Charlie: Oh, you don’t know the tune then do you? Birds upon the tree by W. C. Robey, published New York: Hitchcock’s Music Store, 1882. From the Library of Congress Music for the Nation: American Sheet Music collection. The song was actually written by the American lyricist and composer W.C. Robey, and first published in New York in 1882. The sheet music can be viewed on the Library of Congress Music for the Nation website – you’ll see that the oral tradition has introduced changes both to the words and the melody. The Roud Index lists only two other collected versions: one recorded in the 1950s from Tom Brodie in Cumberland, which can be heard on a Veteran CD Pass the Jug Round ; and the other, intriguingly, collected by Percy Grainger from the great Joseph Taylor. In the extract above, Charlie talks about his grandfather getting his cornet out to accompany this song: in fact Charlie’s father (also Charles) and his grandfather (Tom) both played in the Woodchurch Band, and Charlie himself joined the band when just a boy. There is a photo of the band from the early 1920s, when Charlie was maybe 9 or 10, with him sitting cross-legged in the front, holding a clarinet. The photo shown here is obviously earlier, but both Charlie’s father and grandfather are included in the group. 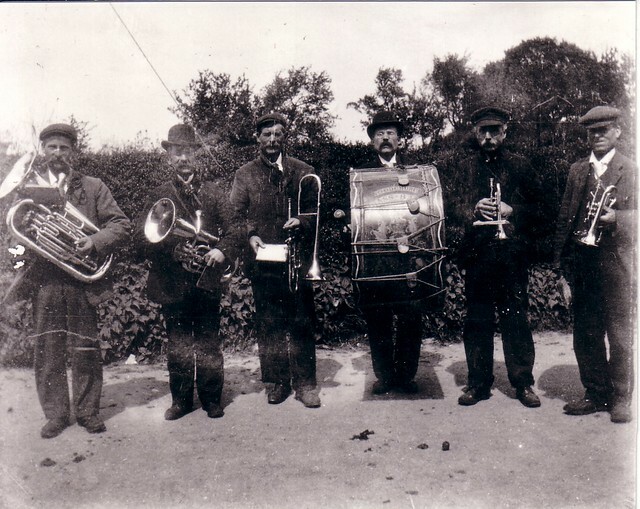 Woodchurch Band: from a copy of the photo provided to me by Charlie Bridger. Charlie’s father (Charles) and grandfather (Tom) are both in this photo. Charlie played with a number of wind and brass bands during his life. When I met him in 1983 he was a member of the Cranbrook Band – playing tenor horn, I believe – and he continued to perform with them until well into his seventies. It is very nearly exactly 30 years since I first met Charlie Bridger, a fine singer from Stone-in-Oxney in Kent, and it’s high time some of his songs appeared on this blog. As reported in an earlier entry my interest in locally-collected songs was first piqued by finding a version of ‘Blow away the morning dew’ from Warehorne in Maud Karpeles’ The Crystal Spring when I was eighteen. Over the next few years I got to hear travellers with a Kentish connection like the Willett Family, as well as singers recorded by Mike Yates such as Jack Goodban from St Margarets-at-Cliffe and George Spicer, who was born and raised in Kent, and had learned many of his songs in the county. At some point I paid a visit to the Vaughan Williams Memorial Library and consulted their list of traditional singers from Kent – although in those pre-computerised days, there weren’t actually many names on it (nowhere near as many as you’d find on a comparable list today). However I did make copies of the songs Cecil Sharp collected from singers such as James Beale, James Barling and Clarke Lonkhurst in the Warehorne area on a rare visit to Kent in 1908 and I added some of those to my repertoire. I also knew that Peter Kennedy had collected songs from another Beale – Albert Beale – at Kenardington (next door to Warehorne) in 1953. Having left University I was working for a year in the public library in my home town of Ashford, and decided to take this opportunity to see if I could find out more about those singers – and maybe even find some more who were still active. The Beales seemed to be a good place to start, so one lunchtime I popped into the Reference Library to look at the Electoral Roll for Kenardington. Kenardington is not exactly a great metropolis, so this did not take long, and I soon had the address for a Mr C. Beale who lived in the village. I wrote to Mr Beale explaining my interest and duly received an invitation to come over one Sunday afternoon for a cup of tea. Mr Beale it turned out was Charles Beale, son of the Albert Beale who Kennedy had recorded in the 50s, and grandson of Sharp’s informant James Beale. On this and subsequent visits he was able to tell me quite a lot about his father’s life and music. Of course I was hoping that singing the old songs had carried on down the generations, but sadly that proved not to be the case. So I asked Mr Beale if he knew of anyone else of his generation who might still be singing. With very little hesitation he suggested Charlie Bridger who, he was pretty sure, was still living at Stone-in-Oxney about four miles away. The two men were of roughly the same age (about 70 at that time) and many years ago had gone to School together. So, back to the Reference Library, this time to look at the Electoral Roll for Stone-in-Oxney – which, once again, did not take me very long. A letter was dispatched to Mr Bridger and on the very day he received it he rang me from the call-box in the village (his house didn’t have a phone), clearly excited at the prospect of singing his songs to someone who might value them, and arranging for me to pay him a visit. Charlie lived with his wife Lily, and they were never less than hospitable when I called on them. Not having gone collecting before I had been somewhat apprehensive that turning up with a big tape recorder might seem a bit pushy, but in fact Charlie really wanted his songs to be collected. He’d written out the words of several of his songs, in that elaborate copperplate used by people of his generation. And as soon as I heard him sing I knew that he was quite some singer. ‘Three Maidens’ was one of those and, I’m pretty sure, the first he sang for me. A few weeks later I went back, armed with the best recording device I owned – which unfortunately was not saying a lot – and accompanied by my friend Adrian Russell, whose family had for several generations lived in the nearby village of Woodchurch, and with which Charlie also had connections. Charlie set us up with glasses of Guinness and proceeded to sing 29 songs over the course of the evening. Inexperienced though I was, I knew that I should be recording everything – and was genuinely interested in what Charlie had to say about his life and songs – but Charlie was very assertive and occasionally I felt I had to comply with his demands that I should stop the recorder (“you’re wasting tape!” he insisted). Hopefully what I missed was just small talk, like Charlie asking us if we wanted another beer; at all events I pretty much filled up three sides of a couple of C90 cassettes. Charlie was very much a performer – he loved an audience and was in his element when we organised music and song sessions at his local, the Crown. Sadly, after a lifetime of manual work, Charlie’s health was not of the best, and this prevented him becoming known to a wider audience. John Heydon invited him to the 1985 National Folk Music Festival at Sutton Bonington, but Charlie was not well enough to make the long journey and spend the weekend away from home. He kept singing locally however, and made a very brief appearance at the English Country Music Weekend at Frittenden in September 1988, just a couple of months before his death. Fortunately for posterity at least, his songs were not preserved solely on my somewhat ropey recordings. In the Spring of 1984 I was at the Vaughan Williams Memorial Library, and Malcolm Taylor introduced me to the collector Mike Yates. Mike came down to Kent shortly afterwards and recorded half a dozen songs from Charlie. These recordings are today available on CDs on the Veteran and Musical Traditions labels. I learnt that off an old man, old Billy King. I gave him a pint of beer. And you got it for nothing – fourpence, that was a lot of money then. He taught me the ‘Folkestone Murder’ too. Where did he live? Well, he originally came from Woodchurch. A Woodchurch man. Don’t think there’s any Kings there now. He was only a little old short bloke. Charlie’s wife Lily pointed out that, as a young man, Charlie mixed with men a lot older than he was – partly perhaps because he played, along with his father, in the Woodchurch Band which would have contained men of all generations; but also, perhaps, because he enjoyed their songs and was keen to learn them. Charlie was almost exactly the same age as Bob Copper, who wrote of the old songs being viewed as old-fashioned and unfashionable by his contemporaries in the pre-war years. Bob and his cousin Ron valued their family songs and they vowed to keep them alive; Charlie, I suspect, shared a similar outlook. A song which seems to have been widespread in the English tradition, under a variety of titles. The farmer can hail from Leicester, Chester, Cheshire, Yorkshire, Sheffield, Devonshire… although why the song is named after the farmer at all is a mystery, when it’s daughter who does all the work. Betsy Renals, from the Veteran website; photo courtesy of Vic Legg. Betsy Renals, Charlotte Renals and Sophie Legg were born into one of the best-known West Country travelling families, the Orchards. They were 78, 77 and 60 years old respectively in 1978 when these recordings were made. Their early life was spent travelling the lanes of North Cornwall hawking haberdashery from their horse drawn wagon Their songs were passed down through their family or learnt at way-side meetings with other travelling families around the camp fire, which could also be the occasion for a step dance often just to mouth music, called ‘tuning’. This fine collection includes well known folk songs, sentimental and comic songs as well as some rarely recorded narrative ballads. I’ve not heard the CD, but three quarters of the tracks were on the original cassette, and both the songs and the singing are a treat. According to the folklorist Sam Richards, Betsy’s song was used by Gypsy singers to establish boundaries when they came into contact with non-Gypsies; the Travellers feeling that, like the heroine of the song, they too were equal to any potential threat that might develop. This is one of very few traditional songs where I’ve felt the need to compose an extra verse. Somehow “She’s counted the money twice over / There were three thousand pounds if not more” didn’t seem a satisfactory ending, so I’ve added another, somewhat tongue-in-cheek, verse at the end.